LNG Allies today released an updated report that summarizes the potential for significant economic benefits and job growth from the U.S. liquefied natural gas (LNG) industry. The report, conducted by ICF Inc., used the most current U.S. Energy Information Administration (EIA) data based on three cases in their 2018 Annual Energy Outlook (AEO) released in Feb. 2018. The three cases include the Reference Case, the High Oil & Gas Case, and the High Oil Price Case. The cumulative economic impact from LNG plants will range from $716 billion to $1.267 trillion. LNG plants would support 2 million to 3.9 million job-years. 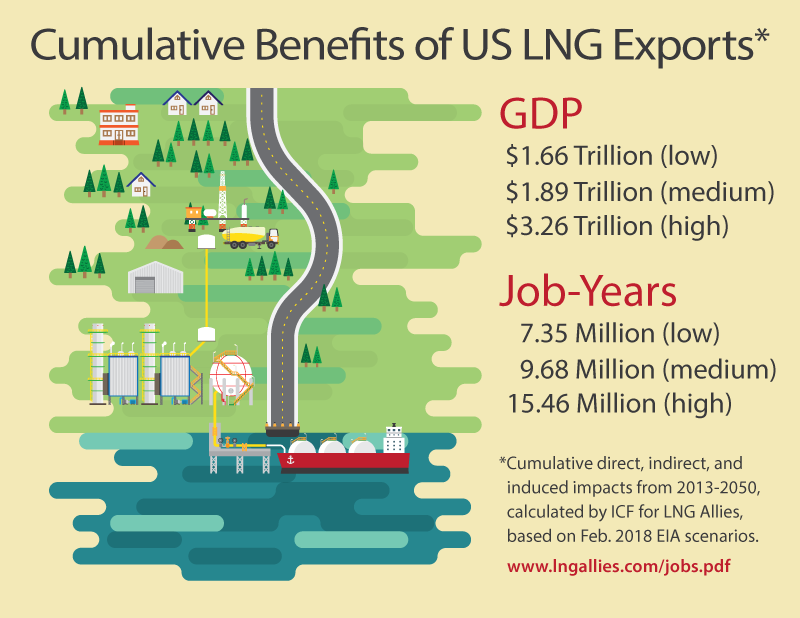 Considering the whole value chain (LNG and natural gas supply) the cumulative economic benefits from U.S. LNG exports would range from $1.664 trillion to $3.255 trillion and 7.346 to 15.459 million job-years.